The Hempel World Cup Series, a four stage international circuit for aspiring Olympians, offered a rare opportunity for North American sailors to enjoy the relative comforts of home on January 29-February 3 in Miami, FL. For the mixed multihull Nacra 17 event, with all three medalists from the 2016 Olympics in Miami, it offered a significant test for training, which for the US Sailing Team proved exceptionally meaningful. When Louise Chafee (Warwick, R.I.) and Bora Gulari (Detroit, Mich.) assembled a late campaign to represent the USA at the Rio 2016 Games, they filled a void within the national squad, and despite some unlucky breakdowns during the Olympics, finished an impressive eighth place. Now they want more, and they know they can’t get there alone. There’s now a genuine partnership between a handful of American teams competing in the class, and while only one of them will qualify for the 2020 Olympics in Tokyo in 18 months time, they recognize the need to all work together to lift their collective game. “What’s really cool is we’ve been working really hard as a squad,” said Chafee. “Traditionally, with the American teams, it’s been every team for itself. 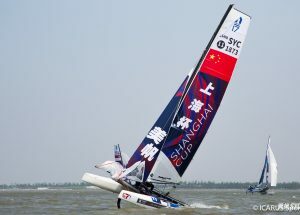 What the Nacra teams have been doing a very good job with, with our coach Mike [Ingham], is we’ve been working together. There are no secrets. Anything we learn, we share with the teams in the debriefs. That way we’re all getting better together. After Chafee and Gulari competed with different partners for the first half of this quad, they have reunited this past fall. After an intense training block, which started in November, they are back in the hunt. 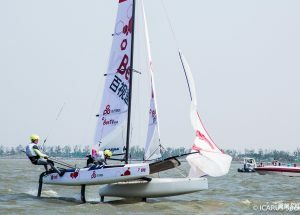 The Rio Olympians aren’t the only USA team making up for lost time as Sarah Newberry and David Liebenberg just started sailing together a year ago. There’s remains a lot of time until the 2020 Tokyo Olympics and the U.S. team is moving, as a group, in the right direction. Two teams finished in the top ten – Gulari and Chaffi (8th) and Newberry and Liebenberg (10th) – with Ravi Parent and Caroline Atwood in 12th and Riley Gibbs and Anna Weis in 15th. No other country had more than two teams in the top 15. 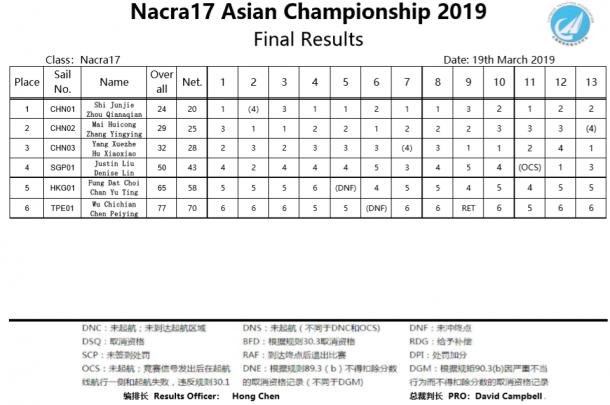 The Nacra 17 class is sailing’s only coed class. 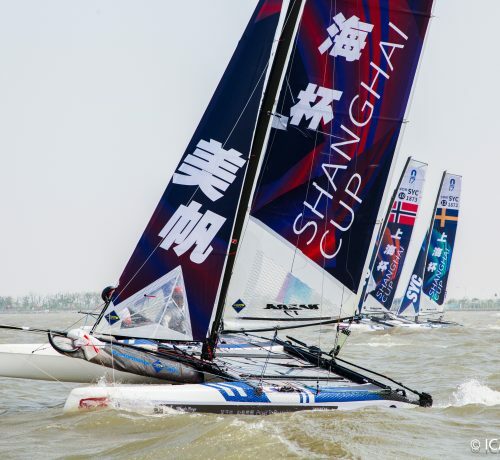 Each team must have one man and one woman, though who skippers and crews is up to each team. Newberry was the only female helm in the Medal Race in Miami. Having a larger male in the crew position can be an advantage. Hoisting, trimming and dousing the spinnaker are among the most physically demanding tasks on the boat. The trials for the U.S. berth in the Tokyo 2020 Games won’t start until later this year. In the meantime. Newberry is looking forward to more cooperative training with her fellow American Nacra 17 sailors.